I bought this tiny book of Gwendolyn Brooks’ poems about a year and a half ago. I picked it up and read two or three poems and put it down. Why? I have no unearthly idea! Insanity! What was I thinking?! 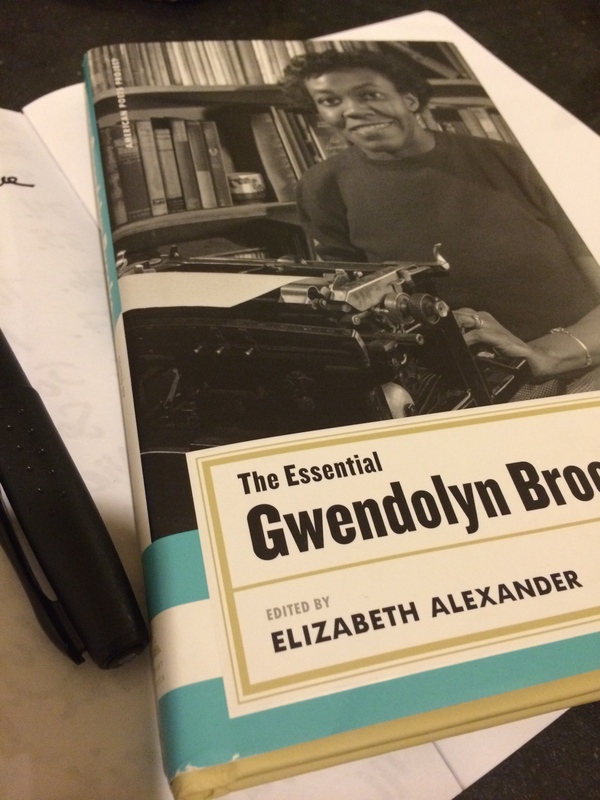 So when I was rummaging through the books on my shelves looking for something different to read for Black History month, I fell immediately on The Essential Gwendolyn Brooks and a eureka came out on contact. I read the entire book of poems in about three hours. I surely could have read it faster but I really wanted to soak up the rich language and ideas conveyed in them. I remember having heard Maya Angelou recite We Real Cool when I was a teenager. Unfortunately, I didn’t have the pleasure of studying Brooks’ poems in high school or at university. While reading I wondered why that could have been. How could such lyrical, moving, opulent, and culturally informative poetry be in essence left to the side? Brooks’ poems speak about racism and African-American life. She mainly wrote about what surrounded her. She said, “If you wanted a poem, you only had to look out of a window. There was material always, walking or running, fighting or screaming or singing.” (The Essential Gwendolyn Brooks, p. xvii) Brooks wrote about 75 published poems by the time she turned sixteen years old. So she never stopped trying to perfect her craft as a poet there after, while in turn writing poetry that reflected the times. With tremendous passion, she was ingenious in writing her poetry in all types styles – blues, sonnets, jazz, ballads, free verse, and even enjambed like in her ever famous poem We Real Cool. Seven at the Golden Shovel. What a wonderful way to celebrate Women Writers month by sneaking a peek at poems written by the first African-American writer to win a Pulitzer Prize for Poetry in 1950. So do you like to read poetry? If so, what are some of your favourites? Let me know if you’ll be reading some novels or poetry written by women this month to honour women writer. Check out this fantastic clip of Gwendolyn Brooks where she shares her thoughts on her writing, race, poetry, African-American women writers, etc.